Spray, 2/4ths of the UK pop group "Cuban Boys", consisting of the man behind the synthesizers, Ricardo Autobahn, and the woman behind the vocals, Jenny McLaren. 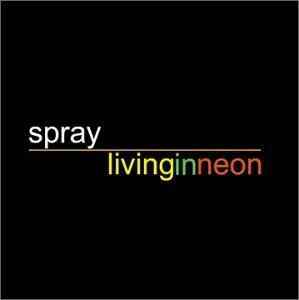 "Living in Neon" is the first album released by the duo - and is certainly in my "Favourite Top 10" Synth-pop CD list. Combining witty humour, what sounds like a vintage drum kit, and catchy, light hearted melodies, Spray have created an album that's British through and through - without being too in your face about it. Personal favourites on this CD include "So Close", "She's a Brainiac" (a rare track where Ricardo sings for a few verses himself, along with a perfect blend of his and Jenny's voices for the chorus), "I Kill With My Car" (a song about the deadly combination of woman and an automobile) and "Spaced" (the catchiest track on the album - once you hear this, you'll have it in your mind for quite some time!). "I Am Gothic" is the single that for this album. The song tells the tale of a spooky kid that's too deep for even phone calls. In fact, she feels special when people *don't* phone. I'm not sure if you can buy them still, but there was a time when Spray were selling "I Am Gothic" t-shirts. These shirts were black (obviously), with "I Am Gothic" written across the front in huge, capital yellow letters (probably not so obviously). All in all, a brilliant effort, and I continue to look forward to what Spray have to offer in the future.